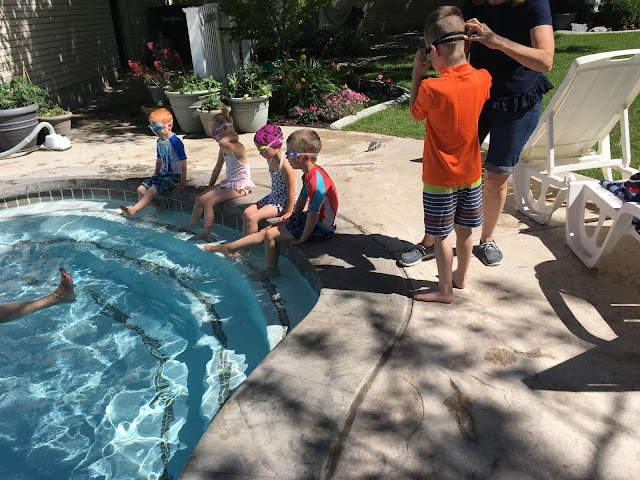 Yesterday was the first day of swimming lessons for the girls (and their cousins). I waited until the day before to tell them about this because when my girls find out about something exciting, they never stop asking about it until it happens, and if whatever it is they are excited about falls through, they never stop throwing a fit about it. I think that's probably normal with all kids. So while the girls swam, V and I ran some errands and got back just in time for some lunch. After lunch, the girls asked (and begged) to get back in. I didn't bring V a bottle but my sister was awesome enough to say she'd bring my girls home so I could let V take a nap. That means I finally had time to finish the curtains! 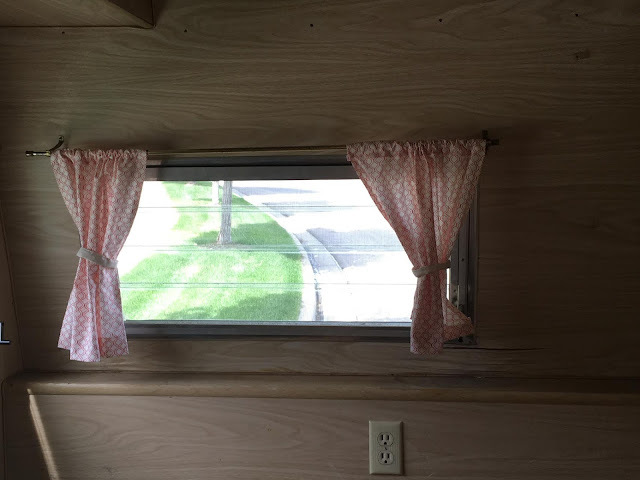 They are cute now, but when we get the rest of the camper done, they will look even better. I followed THIS tutorial pretty close for the curtains. Except, don't get so much yardage! I did 2-inch hems instead of 3, and I didn't double fold. I bought 6 yards of fabric, and I probably used around 4. The good thing is that now I have extra fabric to make a quilt or a pillow or something. We had sandwiches for dinner, I know that sounds kind of boring, but I'm the queen of sandwiches. As long as you have the right bread and a good spread or sauce on it, sandwiches don't have to be boring. 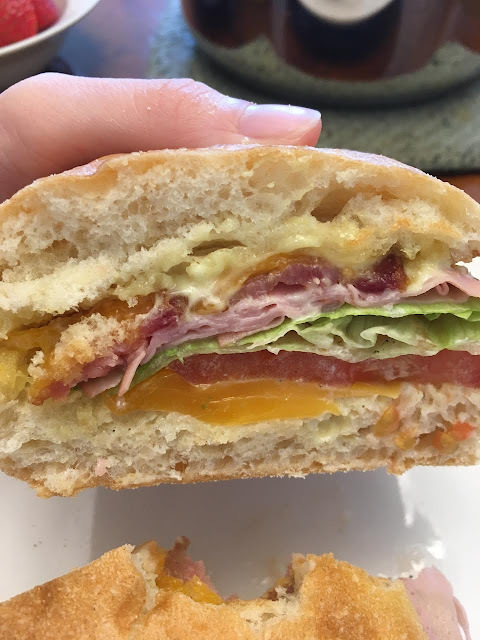 This sandwich has a honey-mustard spread with cheese, bacon, tomato (with a little salt and pepper) melted on it in the oven on Torta, then I add lettuce and turkey (or ham) and it's a pretty good sandwich. In the afternoon I usually water my plants, but I didn't have time until after dinner last night. I noticed that my pot of wildflowers was now just a pot of dirt. So I went over to check it out. 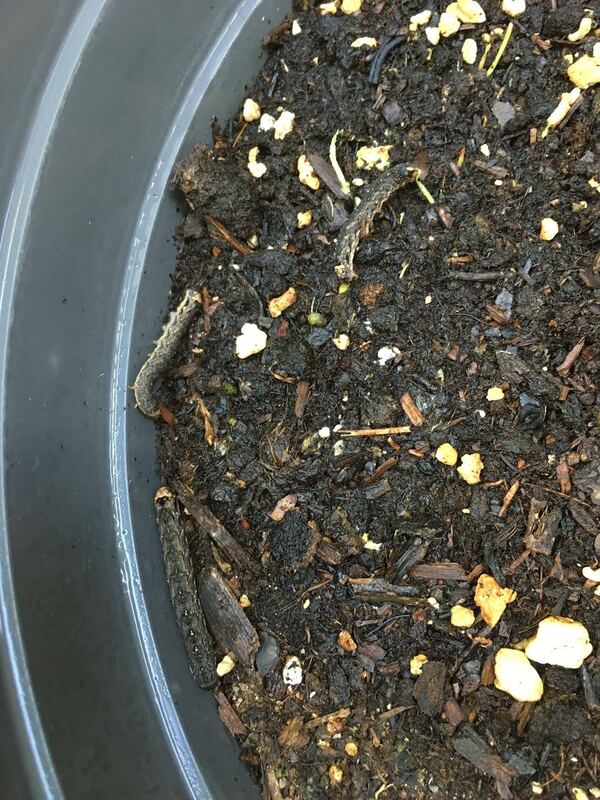 You guys, These three little caterpillars polished off a whole pot of flowers, down to the dirt, in less than 24 hours! I wouldn't have been so mad about it if they were at least cute caterpillars, but no, these things look gross and mean. My girls have no interest in bugs (mostly) and V is too young so I invited the neighbor kids to come catch them and keep them for pets. Now I'm just hoping I got them all. My run was a long run. Four miles at an easy pace (yes right now 4 is long for me. Working my way back up takes time). I've learned through a lot of years of running that the best it's best to take your time working up to distance or speed. When I was on the high school cross country team, I got injured every single year because of 2 things. First, I never listened to my body telling me to back off. And second, I always pushed myself too hard for starting back up. I would take a month off to let my little injuries heal and not become big injuries, and then I'd go right now and run 5 miles my first time back. That would re-injure me. I would get so frustrated and do it all over again. Whether you're coming back after an injury or starting out for the first time, don't push yourself to your hardest the first few times running. Gradually work up. 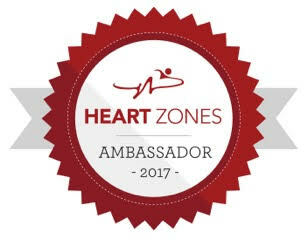 When you start to feel the nagging pains (different from sore muscles or being tired) back off and slow down or stop for a few days. Find out what is causing the problem (shoes, pushing too hard, bad form...) and adjust what you need to in order to keep going. Anyone know how to get rid of caterpillars? What's your favorite sandwich filler? I can't believe those caterpillars ate all your flowers! You're right, they really do look mean! Yeah, I was shocked they were completely gone. We found out what kind of caterpillar it was and sprayed for it.